Rapid urbanization rates and population growth have led to enhanced generation of municipal solid waste (MSW) that can damage the urban environment if it is not managed appropriately. For instance, detrimental environmental consequences may result from the contamination of surface water and groundwater with leachates from MSW; which may contain high levels of dissolved organic matters, inorganic compounds and heavy metals. Hence, global efforts have been made in ensuring proper MSW management by implementing leachate containment and treatment systems. Additionally, regular surveillance and monitoring of leachates is also required to ensure that they conform to national standards. To assist in your leachate analysis, this data sheet presents a purge and trap (PT) GC/MS measurement method that allows the quantification of components in leachate from water supply equipment. 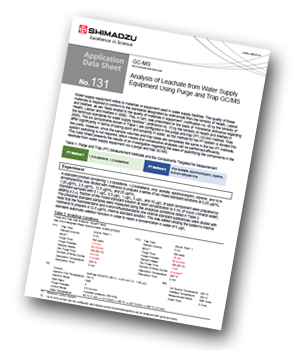 Using the GCMS-QP2020 coupled with a AquaPT6000, the method enables high sensitivity analysis of six targeted components with high accuracy (1,3-butadiene, 1,2-butadiene, vinyl acetate, epichlorohydrin, styrene, and N,N-Dimethylaniline). Furthermore, the results demonstrated high repeatability with less than 5 RSD%.